Weight Loss Success with Indian Diet Plan: How to Lose 15Kg & Feel Fit! The story in pics, a story that each of us needs to hear, that we are just a step away from our fitter selves. A story that teaches us to celebrate the fat loss process, the journey and not the “arrival” and that tells us that as we move down sizes, we should jump in joy punching our fist in the air instead of sulking saying ” dilli abhi door hai”. This story is of Ravdeep Singh, easily one of the favourites of my paathshala. I met him in 2012 at the gym that I had then recently joined as “Weight Loss” consultant (the management said ” Weight Loss” sounds more attractive than “Getting Fit” though I firmly believe in the latter). Even after years of working out religiously & ‘trying out’ everything at the gym but not getting results, an angry & frustrated Ravdeep was sent to me as the last resort to retain a ‘ well meaning’ client. So this is how the journey started. A journey that started from frustation to content, peace and happiness. 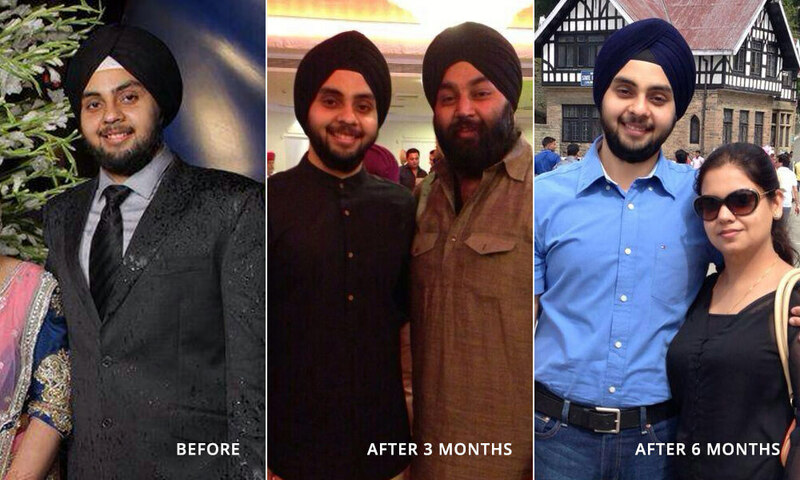 A journey that started from 93 kgs to 81 kgs in 6 months time & still maintaining it for 3 years, a journey from a diet of soups, salads & all the food that was alien to his region, religion and liking to a diet of parathas, pinnis (traditional punjabi ladoos), coconut & everything that he loved but feared eating. It’s a journey of awareness that you don’t ‘have to’ workout because you eat but instead eating food enables you to workout. It’s a journey of joy & fulfilment when you see yourself pushing more weights at the gym & running even faster on the treadmill. It’s a journey of leading life with a sense of responsibility towards the body, about being disciplined so that you always feel free and not trapped inside your body. It’s a journey of courage, grit & determination, a journey that goes beyond the number on the scale. Will you embark on one?